Well! Well! Well! 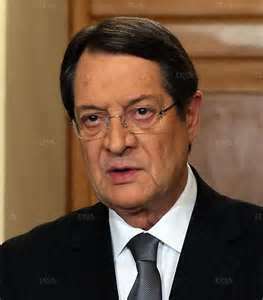 Here we go again………how much longer are these guys going to get away with this!-A.M.
A company owned by in-laws of Cypriot President Nicos Anastasiades wired €21 million from Laiki Bank to London days before the Eurogroup’s crisis-triggering levy proposal, claims a Cypriot newspaper. The president demands an investigation. During two days, 12 and 13 of March, the company A.Loutsios & Sons Ltd., co-owned by Loutsios John, the husband of Nikos Anastasiadis’ daughter, Elsa, took five promissory notes worth €21 million from Laiki Bank. The money was then transferred to London, reported Cypriot newspaper Haravgi, affiliated to the communist-rooted AKEL party. The withdrawal was fulfilled just three days before the Eurogroup meeting when euro finance ministers agreed a 10 billion euro ($13 billion) bailout for Cyprus. The company, however, has firmly denied the reports. The newspaper recalls that Cyprus Finance Minister, Michalis Sarris, publically admitted that the government was aware in advance about the Eurogroup’s intentions to impose a “haircut” on bank deposits of more than 100,000 euros. Spokesman of AKEL, Stavros Evagorou, has called on the investigation committee to check the information regarding money withdrawal by Anastasiades’ family members as well as other reports about money transfer from the country on the eve of the Eurogroups’ levy decision. PreviousCobra Interview Transcriptions Are Coming!